NEW Pop-Up Dies for the Big Shot! Click here for instructions on how to make the 3-tier Cake. 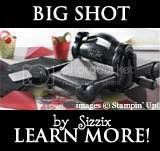 HUGE STAMPIN' UP! SALE, AND A PRIZE GIVEAWAY TOO! I wanted to tell you that I'm so sorry that my Merry Christmas Mystery Workshop had to be cancelled. While we thought we finally got the plumbing taken care of on Saturday, I have a plumber here today, and my little Alex decided yesterday was a good day to find out he has an ear infection. Well, it's not all bad I guess. The plumber said he thinks he can get the drain cleared ( I hope sooner than later! !...I need some clean laundry), and Alex has started an antibiotic yesterday, so we should be good while were away. Stampin' UP! is currently having a MAJOR BLOWOUT SALE TODAY THRU NOV. 30TH!!!!!! Some items are 30% - 40% OFF!!!! This sale ONLY applies to ONLINE orders! Below is a list of all the items that are currently on sale! For all ONLINE Orders of $30.00 or more (placed between today and 11/30/09) will be entered into a drawing to win any of the following prizes. Here is a picture of the inside of the bag. It measures approx. 8"x9"x4. I had these made up and ready to be given away at my Merry Christmas, Mystery Hostess party that had to be cancelled. I love giving things away, so why not share them with all of you. Especially for those of you that were hoping to get your order in for Christmas cards and such. DELAY NO MORE..HERE ARE ALL THE AWESOME ITEMS THAT ARE CURRENTLY ON SALE!!! Discounts range between 30% and 50%! You may view all of the items at www.stampinup.net, click on "store". The discounted price will not show up on-line unless you place the item in your shopping cart. You may order on-line (please select me as your demonstrator when prompted in order to receive the discounts). May you and your families have a very Blessed Thanksgiving! 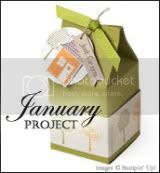 http://traciejacobosn.stampinup.net - You can view, and order all the current products and specials at my Stampin' UP! demo site! THIS POST WILL REMAIN AT THE TOP OF MY BLOG UNTIL 11/30/09. SCROLL DOWN FOR NEWER POSTS!! Just in case you haven't seen the current Stampin' UP! Sale. IT'S INSANELY AWESOME!!!!!!!!!!!!!!! CHECK OUT ALL THESE GREAT DEALS BELOW!!! Don't miss out, get your bargain today!!! I've been a demo for a few years now and have never seen sales quite this great. Remember, it's online ONLY. So, click HERE to head over to my Stampin' UP! Site to place your order today!!! You may view all of the items at www.stampinup.net, click on "store". The discounted price will not show up on-line unless you place the item in your shopping cart. You may order on-line (please select me as your demonstrator when prompted in order to receive the discounts). You may also call or e-mail me to place your order. 7 DAYS LEFT TO EARN SOME GREAT STAMPIN' UP! FREEBIES - DO YOU HAVE YOUR TOP NOTE DIE YET? That's right! 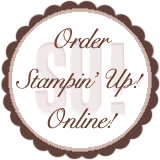 Only 7 days left to take advantage of Stampin' UP! 's most popular promotion! The Sell-a-Bration promotion ends on March 31st and will not return until next year. It's a great time to restock your supplies, or try some new products that you haven't used in the past. Have you noticed all the projects I've been making with the Stampin' UP! Exclusive Top Note Die? I'm heading out of town this weekend to do a Make-n-Take at the Queen of the Crop Getaway in Columbiana, OH. I've used the Stampin' UP! Exclusive Top Note Die in the Make-n-Take that I'm demonstrating since it is of course my most favorite. Here is a treat bag that I made using the Top Note Die. I also used a couple of the FREE Sell-a-Bration items that you can earn NOW thru March 31st with Stampin' UP!. Isn't that "Yummy" stamp PERFECT!! Yes, that's one of the FREEstamp sets that you can earn thru March 31 (the other two are part of the same set), and so is that PERFECT yellow ribbon (you can earn 2 spools of ribbon over 10 feet in each spool, one spool is this yummy yellow, and the other is a gorgeous green, both perfect for any Spring / Easter projects you may have planned). INTERESTED IN SOME GREAT FREE PRODUCTS? Today is your lucky day!!! For anybody that places an on-line order of $50.00 or more between now and March 31st, will not only get to choose 1 FREE Sell-a-Bration Item for EVERY $50.00 you spend (for example, spend $100, and earn 2 FREEBIES, and so on. ), you'll also earn TWO FREE KITS USING THE STAMPIN' UP! EXCLUSIVE TOP NOTE DIE from me. If you love all the recent Top Note Projects that I've made, now is the time to order yours. This die is created solely for Stamipn' UP! and cannot be purchased at any of your local craft stores. Kit 1: Top Note PEEP Treat Bag: Kit will include instructions, all precut papers, ribbon, and bag. (Top Note Die not included). Kit 2: Top Note Treat Bag: Kit will include, instructions, all precut papers, ribbon, bag, and yes, I'll even throw in a little candy treat for you. (The image will be pre-stamped). So, are you ready to place your order? SImply click HERE, to head over to my Stampin' UP! Demonstrator Website, and place your on-line order. If you purchase $50 or more, you will be prompted to choose one of the FREE Sell-a-bration items. Click on Download Sell-a-Bration 2009 to see all the great products you can earn FREE!!!! REMEMBER, THE PROMOTION ENDS AT MIDNIGHT ON MARCH 31ST. All kits will be in the mail by April 3rd. If you have any questions, please feel free to contact email me at tj925silver@hotmail.com. Keep updated when I post to my blog by entering your email address below or subscribing in a reader! This is my personal blog. I am an Independent Stampin' Up! Demonstrator and I am responsible for its content. Stampin' Up! does not endorse the use of or contents of the classes, services, or non-Stampin' Up! products I may offer here.